Hello everyone! It rained last night here in Texas, which is nice because we really needed it. Some quick updates before I begin today's topic: My book is being proofread as we speak (keep up with updates by subscribing to my author website)! I have also become a Shutterstock Contributor, so check out the few photos I have right now of Japan's countryside. Other than that, things have been kind of crazy, but not too bad. So today I'm going to talk about Airbnb! I recently started using Airbnb and I thought it might be helpful for those of you out there wanting to know how Airbnb works and if it's a good option for your next trip. 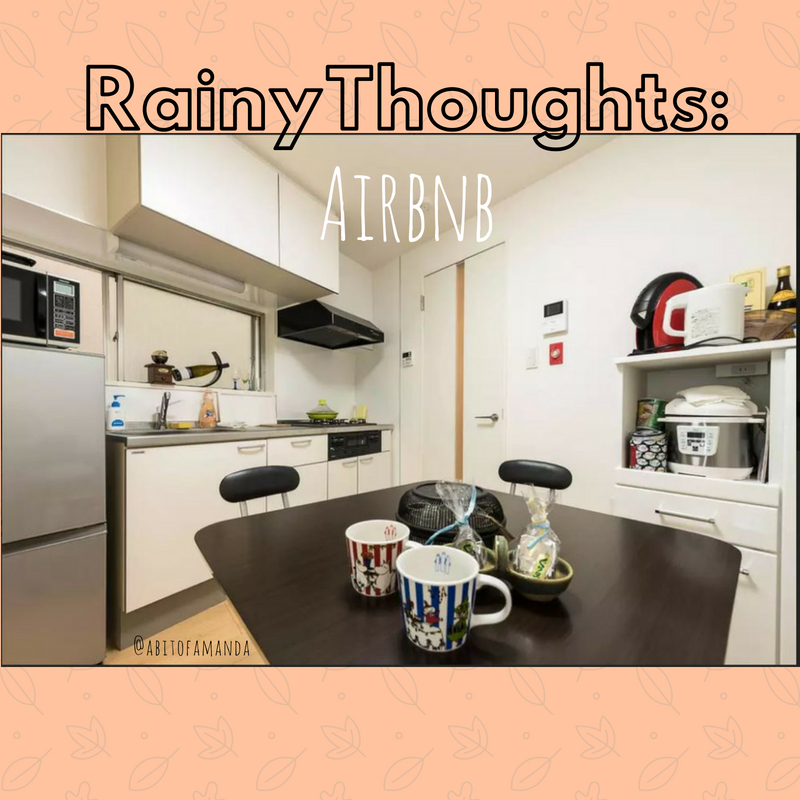 I first decided to use Airbnb when my husband and I were planning our trip to Japan. I was in charge of getting our room and I remember seeing Airbnb commercials recently and was hearing more and more of my friends using this service. 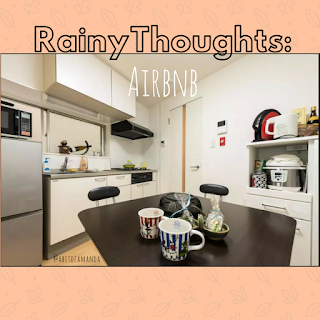 I quickly looked through the Airbnb's in Japan and compared them to the hotels in the areas we were considering staying at. Overall, Airbnb was much cheaper. I paid $413 for 7 nights and 8 days, compared to everything else which was about $600 and up for the cheaper hotels that were far away from where we wanted to stay. My husband and I then chose Airbnb again when we decided to move from the city we originally bought our departure tickets from (Dallas). So we had to get a night both the day before we left and the night we got back. In total, we stayed at 3 different types of Airbnb. Here are my thoughts. Airbnb is typically cheaper. When you book your Airbnb, you will pay a cleaning fee (about $5-$30 depending on the size of the place), which means you don't have to detail clean your area, but you should just pick up before you go. You and your Airbnb will rate each other on the app so hosts can see how past hosts have rated you (so be nice). As a customer, you have the option to choose someone who has done Airbnb a few times or a "superhost," aka someone who has tons of reviews and has done this whole thing before. I personally only chose superhosts because I watch lots of horror movies, but if you want to support and give a new host a try, more power to you! There are cancellation fees, but most hosts give you up to a week to cancel, so if you know a month in advance that you can't go on your trip anymore, you can cancel with no fees. Airbnb's have to provide a lock on their guest room doors for your safety. So if you check into an Airbnb that doesn't have one, question everything. Different Airbnb's have different house rules, but everything is laid out before you book. There is no fee to use Airbnb and all transactions and communications are through the app or the website. The first Airbnb we stayed at was a private room in a house. Check in was at 3pm and we could check in anytime afterward (reasonably speaking). We stayed in a private room in the house with 2 other guests sleeping in their own rooms. Our host and hostess, Peter and Shay, were really friendly and nice to us. They let us have free roam of the living room, kitchen, and two bathrooms. They had snacks set up in the living room with a small coffee bar. Our room was themed and came with a vanity, free Netflix and Hulu, guest wifi and a lock to our door. Yes, like locks you would put on your front door if you didn't want people coming in, which actually made me feel very comfortable. Our stay was comfyand even though the guest down the hall could be heard snoring, it was a nice place to stay for the night. When we went to Japan, we had a whole apartment to ourselves and I absolutely loved it. Our host was Kaoru and he was so helpful and had such a clean apartment! We were able to wash our clothes, cook, microwave leftover, buy food to put in the fridge to eat later. We also got to sleep on one of a traditional Japanese bed, which actually was more comfortable than we thought it was going to be. My favorite thing about having the entire apartment to ourselves, especially in a different country, was that it didn't feel like we were tourists, minus the camera I had around my neck the whole time. We watched Japanese TV in the morning, went to our local 7/11 for rice balls and morning sandwiches. I felt like we were locals, even though I know we definitely were not. Another thing that I enjoyed about this Airbnb, was that we were in a nice and quiet neighborhood with neighborhood priced restaurants and bars. (We stayed next to a 200 yen bar, which is basically a $2 everything bar). We weren't bombarded by other tourists and skyrocketed prices. Our last Airbnb was in a private room that was technically in-house, but it felt more on one side of the house. Our host, Robert Bo, was great at communicating and let us check in late since our flight was delayed. Our room was pretty spacious and came with an equally big washer and dryer, with lovely decor, private bathroom, mini fridge, and coffee pot. He had a table with a journal that had all of hiss recommendations of the area, plus some other people who have stayed there as well. It was such a cozy room and he had said that we could roam around the house, but we didn't have too much time to stay. In conclusion, I would highly recommend staying at an Airbnb, especially if you're looking for something for the night, if you want something cheaper, or if you are going to a different country. Will I continue using Airbnb's? Yes! Will I continue booking hotels? Yes, I would for certain travel areas, but in all honesty, I really enjoyed staying at an Airbnb and will probably be booking more of them than actual hotels. Hope this has helped you if you are considering staying at an Airbnb. My husband and I actually want to start an Airbnb once we get a house and my parents are into the idea as well. If you want to check out Airbnb to book your next vacation, head to the Airbnb website today! So, things in life are happening, so we'll see if this month I'll get back on my usual schedule. 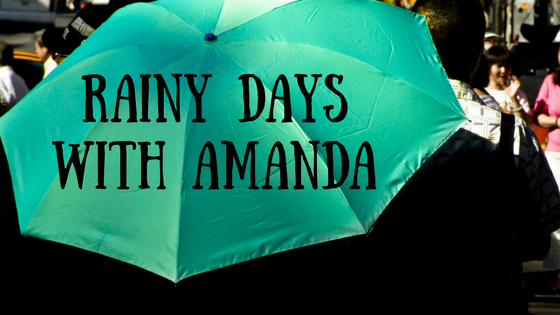 But until then, I have a new book review just for you! (and you, and you, and you!). As some of you may or may not know, I am currently writing my book. Actually, it's almost done. I just ordered my draft copy last week, so we'll see how that goes. If you would like to keep up with that new or like to see pictures of cats, quotes, nature and some of the weird and pretty things I find, then subscribe to my author page! 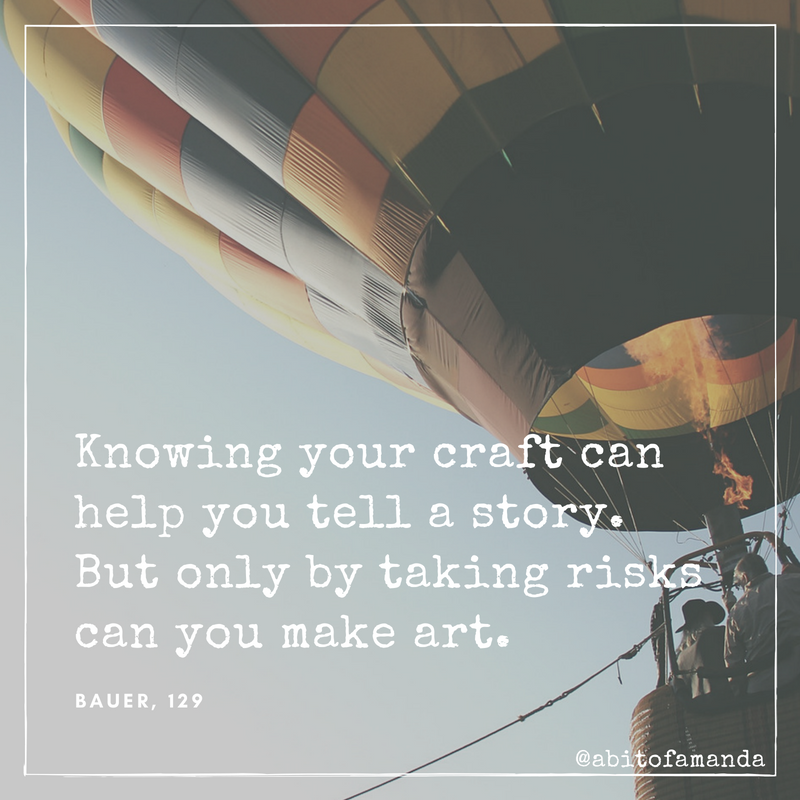 So, have any of you ever thought of writing a book? Well, I can tell you reading a book about writing a book was not my first reading choice, but it was a good choice and I'm glad my friend gifted it to me for my birthday. 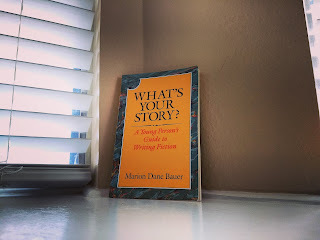 Here is my review of What's Your Story? A Young Person's Guide to Writing Fiction by Marion Baurer. 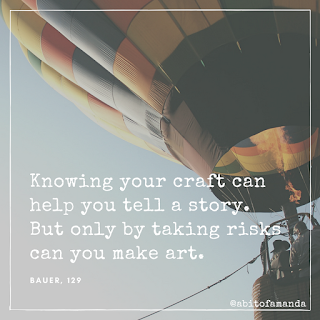 Let's take a quick look at author Marion Bauer. Bauer has been writing since the high school. She went to school at eh University of Missouri for Journalism, where she quickly realized (much like me) that journalism writing was not the kind of writing for her. She then switched her degree to English literature. Sometime after she briefly worked as an English teacher, became a mom of two and pet and foster mom of many, she decided it was time to write. This book is all about how to write a fiction book for beginners. The book goes through all the phases of writing a book, from initial ideas, planning it out, character development, focusing the story, afterwards and so much more! When someone thinks of a "How-To" type of book, they might think it will be boring. That is what I kind of thought how this read was going to turn out. I was pleasantly surprised when I found this book to be pretty enjoyable. Bauer does a good job of wording her book to make it sound like she is talking to us like human beings and not a robot with no feelings. The reader feels welcomed by the first page and stays captivated by the first chapter and keeps on reading because you just want to know her view and opinions on what to do next. The reader can also appreciate the topics that Bauer goes over. As stated earlier, Bauer goes through everything, not just certain parts of writing. From pre-writing to post-writing, she goes through the whole cycle. One last thing that is enjoyable is the honesty. 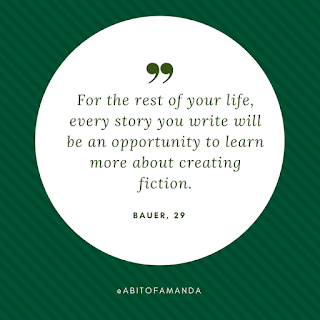 Bauer is honest about everything, even the part where she said that the chances of getting published are very slim, so keep writing for fun. There wasn't anything that I didn't enjoy. As stated before, Bauer goes through everything and is honest. Things the reader can truly appreciate. In conclusions, this was a great book if you are looking to write fiction, whether it's for fun or for a more serious route. The book is fun to read and Bauer does a great job in grabbing your attention every chapter. Will definitely keep this book around to reference back to and look through for my current book and beyond. If you enjoyed this book review, please subscribe and if you would like to receive updates from me, follow me on Twitter, Instagram and Pinterest! Until next time, Happy Reading! I am a Marketing Director, a Social Media Coordinator, and freelance writer who likes to have creative outlets, such as this blog.